Architectural sheet metal fabricator, and manufacturer of aluminum sunshades and light shelves in the Denver area. Hello, we are H&H Metals. 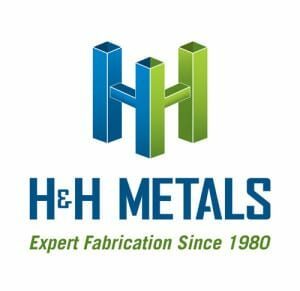 What sets H&H Metals apart as a metal fabricator? H&H Metals is a custom sheet metal fabricator job shop in the Denver metro area. We work quickly and efficiently to handle all of your metal manufacturing needs. Through exemplary customer service, we’ve built a loyal customer base. We offer high quality products at affordable prices. Can H&H handle my project? H&H can handle all of your commercial metal needs. Our innovative approach to sheet metal keeps costs down. We have the capacity, machinery, and knowledge to get the job done right, in the most efficient way possible. Please see our sheet metal fabrication page for an extensive list of capabilities, and equipment we use to save you money on your next sheet metal project. What kind of metal do you carry? A metal fabricator isn’t much good without having metal in stock. That’s why we carry a broad range of flat sheet products in steel, stainless steel, and aluminum. We also fabricate cut-to-size plate, tubing, flat bar, and angle. Our large stock of sheet metal products enables us to provide faster turnaround on orders. We know that in today’s business, you needed it yesterday. H&H is here to help. The best way is to download our order form. You can find all the pertinent information to place an order on our sheet metal products page, and information on what materials you would like to use on our sheet metal stock page. O.T.I.S. is our Order Tracking & Inventory System. O.T.I.S. keeps you up to the minute on the progress of your project via email, and allows us to focus on what we do best: crafting the best metal fabrication projects in Denver! It enables you to see exactly what we are making for you, when you can expect to have it ready, and notifies you when your project is finished. It’s a seamless way to improve communication, reduce errors, expedite turnaround, and save you money. Why should I choose H&H as my metal fabricator? H&H offers talented employees, 35+ years of experience, and excellence in customization and specializing, in our multi-faceted shop. When it comes to metal, we can do it all! How can we help you? Get in touch with us today to find out how we can make your vision a reality.